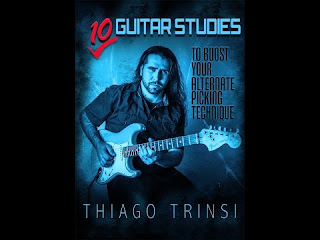 is the new guitar lesson package release by Thiago Trinsi. This guitar lesson package is strategically designed to unlock your full potential with 10 original studies that will bring you to a whole new level. the picking hand may encounter in playing situations. Mastering these guitar studies enable the execution of any ideas that you may have while improvising and help you to master alternate picking technique beyond the limits. * and for those who wants to expand and master the technique in 1, 2, 3 notes per string, over arpeggios, string-skipping, open string, horizontal and vertical patterns.